A large number of U.S. cities, both big and small, voiced concerted and coordinated opposition to the FCC’s proposal to streamline the deployment of small cells across the country. At the center of the issue is the federal government’s attempts to override local government control over the installation of wireless equipment like small cells in neighborhoods around the country. The FCC essentially argues that some state and city rules are unnecessarily impeding the deployment of wireless infrastructure, including 5G. But a large number of U.S. cities are fighting back against that argument—contending that they should remain in charge of the costs and timelines associated with small cell deployments. The comments by Los Angeles Mayor Eric Garcetti are particularly noteworthy considering the wireless industry has generally cited the city as a suitable partner for smart city and 5G deployments. Indeed, T-Mobile, AT&T and Verizon all plan to launch 5G in Los Angeles in the coming months, and the GSMA recently held its MWC Americas trade show in the heart of the city. Further, Young is the vice chairman of the FCC’s Broadband Deployment Advisory Committee (BDAC), which was tasked with finding a balance between the needs of cities and telecom providers. Some BDAC members continue to complain that the group isn’t reflecting the needs of local government. John Davis, the manager of the Borough of Doylestown in Pennsylvania, pointed out in a recent interview that the FCC’s rules would aid the wireless industry by allowing carriers to deal with one single entity—the city government—to deploy small cells, instead of having to deal with multiple private land owners. But he also said that Doylestown would adjust its approach to the issue based on whatever rules the state and federal government decided on, and he also acknowledged that the installation of equipment like small cells does benefit Doylestown residents with better wireless service. Davis said that, in recent years, the city worked with Crown Castle and others on a small cell deployment. Crown Castle initially wanted to deploy the gadgets in dozens of locations around the city, including directly in front of a 19th-century castle museum called the Mercer Museum. The city initially balked, Davis said, because the deployment could affect the aesthetics of the tourist location. The rules won’t disturb existing small cell legislation at the state level but will provide guidance on local reviews of small cells that can inhibit deployment. State governments can charge wireless providers for the costs associated with reviewing small cell deployment, but the FCC’s rules will prohibit what Carr described as excessive fees. 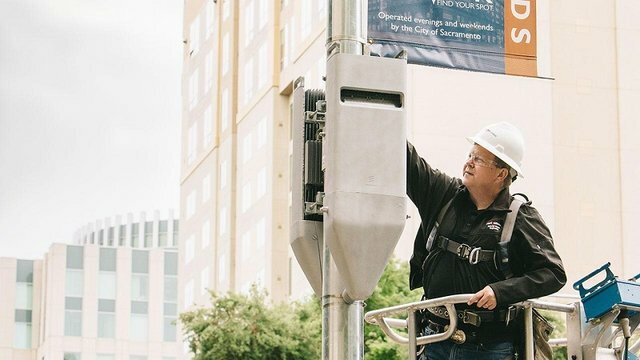 Local governments will need to conduct approval processes within 60 days for small cells being added to existing structures and 90 days when a provider wants to put up a new small cell pole. Local governments will be able to manage small cell deployments via “reasonable” aesthetic reviews.